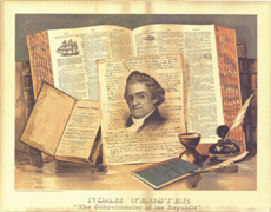 Noah Webster was born on October 16, 1758 in the West Division of Hartford, Connecticut (now West Hartford). Webster grew up in an average colonial family – his father farmed and worked as a weaver, while his mother worked at home. At the time, few people went to college, but Webster enjoyed learning so much that his parents sent him to Yale, Connecticut’s first college. He left for New Haven in 1774 when he was 16 and graduated in 1778. Webster wanted to continue his education by studying law, but his parents could not afford to give him more money for school. After thinking about his options, Webster began working as a teacher. During his years as a student and then as a schoolteacher, Webster realized the American education system needed to be updated. Children of all ages were crammed into one-room schoolhouses with no desks, poor books, and untrained teachers. Although this was after the American Revolution, their books came from England, often pledging their allegiance to King George. Webster believed that Americans should learn from American books, so in 1783, he wrote his own textbook: A Grammatical Institute of the English Language. It earned its nickname, the “Blue-Backed Speller”, because of its characteristic blue cover. For over 100 years, Webster’s book taught children to read, spell and pronounce words. It was the most popular American book of its time, selling nearly 100 million copies. In 1789, Noah married Rebecca Greenleaf, the daughter of a rich man from Boston. During their long marriage, they had eight children and numerous grandchildren. The family lived in New Haven, and then moved to Amherst, Massachusetts. There, Webster helped to found Amherst College. The family later moved back to New Haven. In 1801, Webster started working on defining the words that Americans use. He did this because Americans spoke and used words differently than the English, and to help people who lived in different parts of the country to speak and spell the same way. In his dictionary, Webster used American spellings like “color” instead of the English “colour” and “music” instead of “musick”. He also added American words that weren’t in English dictionaries like “skunk” and “squash.” His first edition, A Compendious Dictionary of the English Language was published in 1806. This book offered brief definitions of about 37,000 words. It took him 22 more years to finish his American Dictionary of the English Language. When he finished in 1828, at the age of 70, Noah’s dictionary defined over 65,000 words. 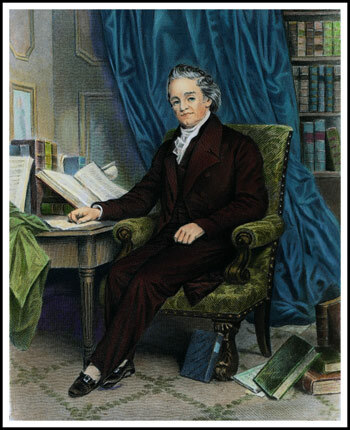 Noah Webster accomplished many things in his life. Not only did he fight for an American language, he also fought for copyright laws, a strong federal government, universal education, and the abolition of slavery. In between fighting for these causes, he wrote textbooks, edited magazines, corresponded with men like George Washington and Benjamin Franklin, helped found Amherst College, created his own version of an “American” Bible, raised eight children, and celebrated 54 anniversaries with his beloved wife. When Noah Webster died in 1843, he was an American hero.